Oh hai internets! How the heck are you? So I have shuffled, bear like, into the weak glare of what we Wellingtonians laughably* call "spring"** and it turns out Daylight Savings has totally put me back into the painting mood. As luck would have it, I have quite a large collection of things to be painted! Since I'm currently reading through Dark Heresy the need for skulls and big shoulder pads is strong in me and so the Circle of Painting turns, turns, turns once more and suddenly it's Space Marines everywhere. Mild apologies to those Warmachine fans amongst you but don't worry, I'm bound to get the urge to do some steam powered robots again soon. I'm a fickle beast. Where to start? 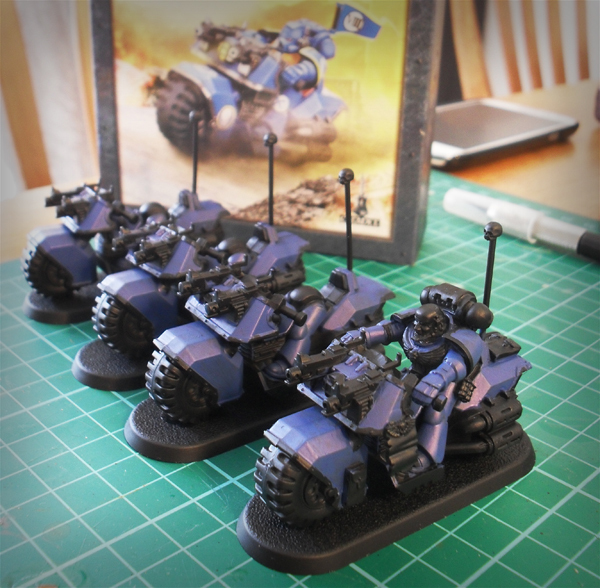 Well I now have four space marine bikes, thanks to my lovely future brother-inlaw who likes to give me 40K stuff for birthdays and Christmas. Excellent habit that, and one that has put him in good standing for when I become king. Here are some pics. Three pairs of armoured pants on bikes and their brave leader. Look, bikes! With some blue on them! I'd glued the sargeant dude down and it's actually less hassle than I thought it would be to paint him while he's in the saddle so I'll probably put the rest on too. 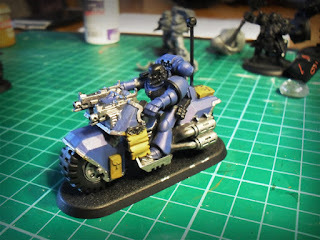 Here's Sarge with the blue, chrome and leathery bits base coated. As you can see I stuck some extra pouchy bags on his bike because leather pouches are awesome. Just ask Rob Liefeld. This was as far as I got after work today but I felt like it was a good start after a few months of no painting. 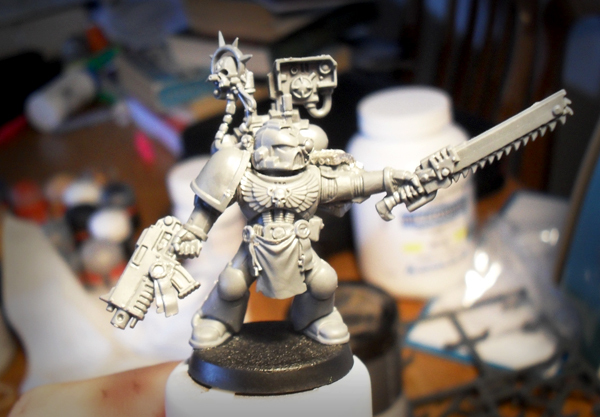 Last but not least, I decided to put together and undercoat the sargeant of the Devastator squad, because he's pretty much my new favourite model. It's all because of the floating cybernetic skull perched on his shoulder. Who doesn't love a floating cybernetic skull? I'll tell you who. Communists. Aaaaand that's me. I plan on trying out these new fangled GW paints that I've been hearing so much about and will otherwise be contentedly beavering away on my space smurfs. Until next time, sports fans. *While crying into our lattes. *It's kinda like our winter only the electricity bills are a bit lower.